Want to do a Breakout Game with your class? There are 2 Breakout Boxes available for checkout from the central office. Joy Smithwick can show you where they are. Boxes are self-serve. You will pick up and return the boxes from Central Admin. 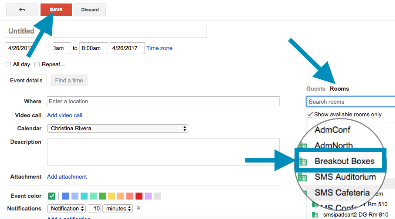 Reserve the breakout boxes using Google Calendar. They are listed as a "room" on the right. Please remember to give yourself ample time to set the locks before your game day and make sure to return them before your reservation ends.